At September 1st, 2016 under pouring wet skies, 3 RCMP vehicles (5 more on hold at the Roberts Creek Community Hall) attended the Elphinstone Forest Protection Camp. We informed the RCMP that ELF’s lawyer made an application yesterday with the Vancouver Courts for a Sept 6th (Now Rescheduled for September 8th) hearing to discuss the matter. He responded by saying they must enforce the Injunction or be held in contempt, however we requested that he exercise discretion. He stepped away and called the RCMP lawyer who called ELF’s lawyer whom confirmed the Sept. 6th (Now Rescheduled for September 8th) hearing. 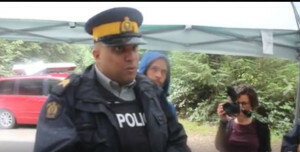 The Sergeant then called Peninsula Logging, and they agreed not to come to the site to log if we agreed to remove the blockade (which we did) and that they would continue to hold off from activities pending the hearing. The hearing will determine if the Ex Parte Injunction is valid. If its gets ‘lifted’ or thrown out then the matter is set to be discussed September 26th (9:45am) in the Vancouver Law Courts. Over 90 days ago ELF’s lawyer informed Peninsula Logging that should they seek an Injunction ELF would like their day in court, which most lawyers respect as a fair and due process. In our opinion, Peninsula Logging Ltd. (local Sunshine Coast residents) applied for this Ex Parte (“parties not present”) injunction, due to being informed of a Forest Pratices Board investigation (plant study) of the cutblock to be conducted Sept.12th, and possible had concerns of its outcome. ELF had one other Ex Parte Injunction thrown out of court in 2012, and anyone arrested was cleared of charges, so we hope a precedent has been set. For some reason, Justice Cole in Vernon is the Judge to go to in this Province for industry when they seek to pull a fast one to avoid due process. Sechelt RCMP observed cars and trucks being removed from the roadblock, and then we took a thumbs-up group photo. A small battle was won today, however the larger issue of expanding the Mt. Elphinstone Prov. Park and stopping BCTS A87125 from being logged – a key section in the park expansion area continues.